A ten week career education course that teaches the essential knowledge and skills for obtaining a job in one of the fastest growing occupations. What does a professional dental assistant do? Dental assistants sterilize and disinfect instruments and equipment, prepare and lay out instruments and materials required to treat each patient, and obtain patients’ dental records. Assistants make patients comfortable in the dental chair and prepare them for treatment. During dental procedures, assistants work alongside the dentist to provide a helping hand. They exchange instruments and materials to dentists and keep patients’ mouths dry and clear by using suction or other devices. They instruct patients on postoperative and general oral health care. Dental assistants prepare materials for impressions and restorative procedures. They take dental x-rays, and process x-ray film and images as directed by the dentist. They also remove sutures, apply topical anesthetics to gums or cavity-preventive agents to teeth, remove excess cements and adhesives, and place rubber dams on the teeth to isolate them for individual treatment. Dental assistants with laboratory duties make plaster models of the teeth and mouth from dental impressions, clean and polish removable appliances, and make temporary crowns. Those with office duties schedule and confirm appointments, receive patients, keep treatment records, process and track insurance claims, send bills, receive payments, and order dental supplies and materials. How much money does a dental assistant make? According to the U.S. Department of Labor, the median hourly earnings for dental assistants was $16.59 in May 2012 or $34,500 per year. 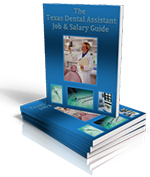 What is the job outlook for dental assistant employment? Employment of dental assistants is projected to grow 25 percent from 2012 to 2022, which is much faster than the average employment for all occupations. Ongoing research linking oral health and general health will likely continue to increase the demand for preventive dental services. The course meets one day per week on Saturdays only for 10 weeks. A $500 down payment and a copy of your high school diploma or GED certificate. How much does the tuition cost and do you have a payment plan? The tuition is $3,750.00. Payment options are available that make it affordable for the student to pay tuition weekly. An application can be completed online, at our dental office, or by way of a postal packet mailed to you. C. Mark Mann School of Dental Assisting is located in Sugar Land Texas. It is in the Imperial Medical Center and located on Highway 6 at Brooks street between Flour Daniel Blvd and University Blvd. across from the Sugar Land Police Station. Classes are held in the dental office of Dr. Mark Mann. We respect your privacy! Your information is safe with us! We never give your personally identifiable information to any outside parties.